Let nothing, therefore, be put before the Work of God. Christians throughout history, especially monks and nuns, have practiced a communal form of prayer known as the Officium Divinum. This could be loosely translated as the divine commission, or the task of heaven, but is traditionally called “the Divine Office.” This ancient Christian practice is also called the Liturgy of the Hours (Liturgia horarium) or, as St. Benedict refers to it in his Rule, the Work of God (Opus Dei). Like the prayers said in synagogues and homes by Jesus and the apostles, and by many Jewish generations before, the greatest part of this divine commission or “work of God” is simply the singing of Psalms and the reading of Sacred Scripture. Today, the monks of Holy Cross Abbey come together in prayer seven times daily, starting at 3:30 AM. We invite you to join us in this ancient prayer, whether in our chapel or from your own homes as described below. Here’s the schedule, or Horarium, for our communal prayer. These liturgical “hours” or “offices” can also be prayed using the embedded webpage below. Every day for well over 1500 years, monks have used this Liturgy of Hours to help the Church fulfill Our Lord’s command to “pray without ceasing,” and keep watch, waiting in hope for His second coming. (See Matthew 26:41, Luke 21:36, and 1 Thess 5:17.) Following the prayer of Israel, of Jesus and of the apostles, it has been the unceasing prayer of the universal Church throughout history, and it remains the prayer of Holy Cross Abbey today. We invite you to pray with us! Many have come to Our Lady of the Holy Cross on retreat or to mass or for one of our services. So many have said “I wish I could do this more often;” then time and our busy lives make that hard. It does require small sacrifices, but if we start small, keep it manageable, make it habit and not a burden, it will become life-giving! The Liturgy is the blood of the Mystical Body of Christ—-the Mass, or Divine Liturgy, first, and the Liturgy of Hours, second. So the Church calls all of us to prayer. We encourage you to breathe with the psalms and let your heart beat as one with the church in the rhythm of the Liturgy of the Hours. 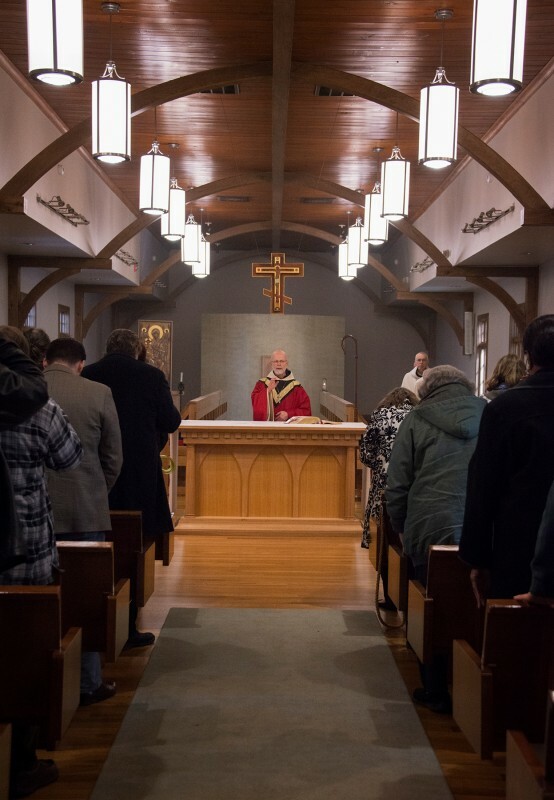 In doing so, you can join the monks who stand daily in choir at Our Lady of the Holy Cross Abbey, as well as the millions of other Christians who pray the Divine Office. Many lay people make a point of praying the Liturgy of the Hours during the day. Perhaps not all seven offices or hours, but many people start and end their day with this prayer, and if you get into the habit and rhythm of prayer, you will find yourself missing it when you don’t do it. It becomes part of your life and something you can’t do without. If the demands of your vocation prevent you from praying a full “hour” from the Breviary, you could stop for a moment and say the Lord’s Prayer seven times a day as your Office. While you’re here, we invite you to do two each things to get started. Let us know if there is anything you want us to pray for, under “Contact Us”, so we can remember your intentions as we pray. Then simply scroll down to the bottom of this page and find the Divine Office for today, and don’t forget to pray for us! Then, if it’s helpful, come back and use this page to pray with us daily. If you can pray every day, in any way, you are with us, joining your voice to our Abbey choir, the Church, and the choirs of angels. Together–and we, the brothers of Our Lady of the Holy Cross Abbey, mean together–we will offer up a worthy prayer to our Lord. Joined to Christ and one another in the one mystical Body, we offer immeasurably greater praise to the Father, Son, and Holy Spirit. Most of the names of these rituals of prayer were adopted directly from the Latin terms for the time of day at which they were to be prayed. Terce, Sext, and None are prayed at the tertia (third), sexta (sixth), and nona (ninth) hour of the day, using the ancient reckoning of daylight hours. Vespers means the “evening hour” of prayer, and Compline–in Latin, completorium–is the prayer “for things done,” in repentence, praise, and thanksgiving at day’s end. Lauds is the only name which is not based on the clock. Lauds means “the praises [of God],” because it ends with a psalm of praise–traditionally, with either Psalms 148, 149, or 150. Vigils follows the naming pattern by time of day, but deserves at least a footnote or two. The Jewish night was divided into three vigils, or “night watches,” whence we derive the three nocturnes of Sunday Vigils. Vigils also came to be known as matins, meaning “in very early morning,” due to monastic convention of praying vigils at that time; vigils can, however, be prayed the night before because it is originally not so much a “prayer of the early morning” as a prayer of the night watch. During Holy Week, for example, you may been to a Tenebrae service. Tenebrae is actually Vigils of the Holy Triduum–Holy Thursday, Good Friday, and Holy Saturday. In many parishes where gathering the people at night, before dawn, is difficult, the Vigil of Tenebrae (“Darkness”) is recited in the evening on Wednesday, Thursday, and Friday of Holy Week. The original Vigil, of course, is the Easter Vigil. It is said that all liturgy is prayed in memory, imitation, or anticipation of the great liturgies and mysteries of Holy Week, and the greatest liturgy of all is the Easter Vigil, as the Church watches for the Resurrection. “Watch and pray” (Matthew 26:14) with the Lord and with us, then, in hope of rising soon with Christ to everlasting life! The four volumes of the Breviary are the official Catholic standard and therefore are sometimes referred to as the Liturgy of the Hours, but there is also an easier one-volume version called Christian Prayer, or even the Shorter Christian Prayer. You may decide you want to pick up one of these books. There are also many helpful websites for praying the divine office, including Divineoffice.org, universalis.com, and ibreviary.org; the Episcopal Office is at dailyoffice.org. On these sites you can find all seven offices of the church, including the so-called ‘minor offices’ of Terce, Sext and None. The web versions and mobile apps make it easy by eliminating the need for three or four ribbons and the initially daunting task of figuring out what page in the book you are supposed to be on. Office of Readings can be prayed at any time of day (the equivalent, or monastic Vigils or Matins is properly prayed at night, before dawn).